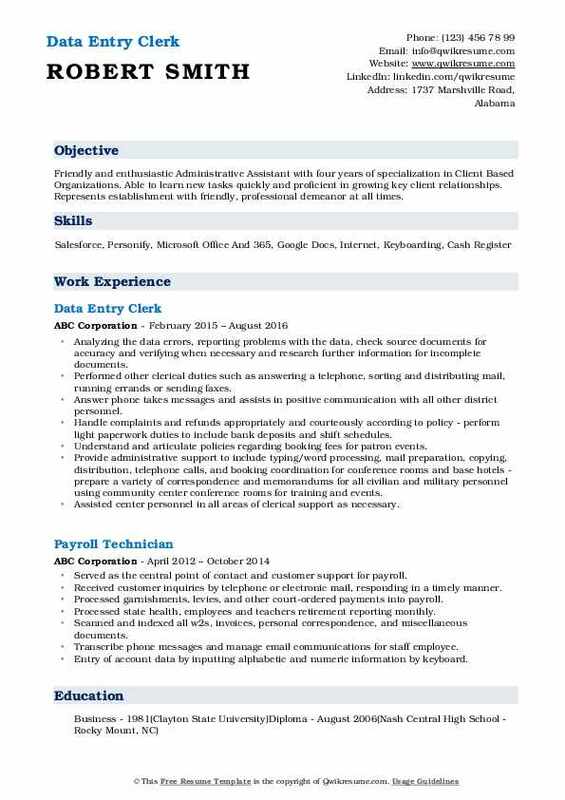 A Data Entry Clerk will transfer the information from the paper documents into the company’s electronic database. 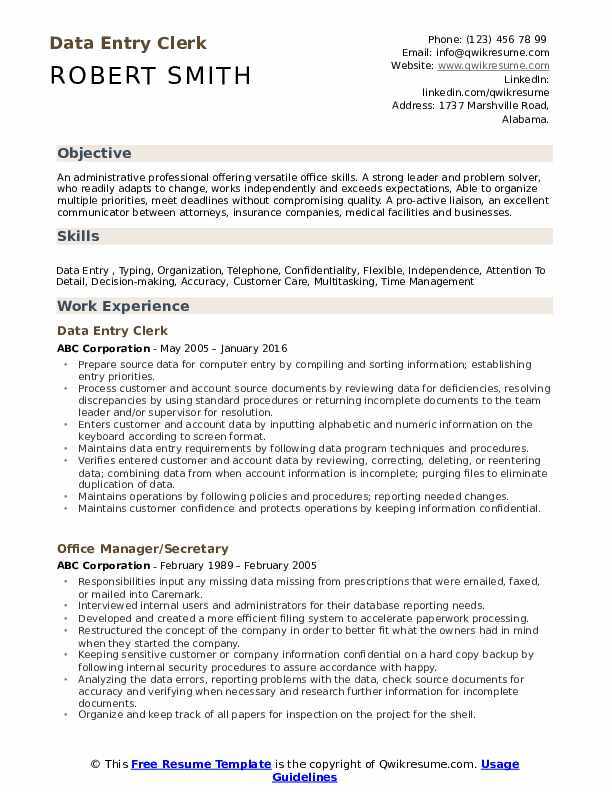 Some of the roles and responsibilities that are mentioned on the Data Entry Clerk Resume are – typing into the computer system information taken from the paper documents, typing in data directly from customers, creating spreadsheets and storing large number of figures without mistakes, verifying data accuracy by comparing it with the source document, updating existing data, and performing regular back-ups to ensure data quality, safety and storage. 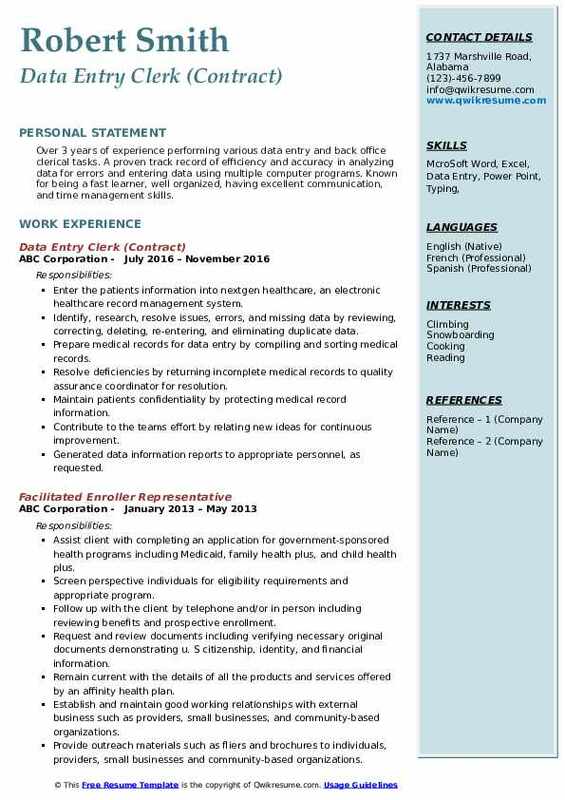 Hiring companies look out for the following skills on the resume – fast typing skills, ability to use the touch screen with utmost fluency, excellent knowledge of word processing tools and spreadsheets, working knowledge of office equipment and peripheral devices, and a basic understanding of databases. Employers don’t need more than a high school diploma for this role, however, proven work experience in the same cadre will be preferred. Summary : An administrative professional offering versatile office skills. A strong leader and problem solver, who readily adapts to change, works independently and exceeds expectations, Able to organize multiple priorities, meet deadlines without compromising quality. A pro-active liaison, an excellent communicator between attorneys, insurance companies, medical facilities and businesses. Prepare source data for computer entry by compiling and sorting information; establishing entry priorities. Process customer and account source documents by reviewing data for deficiencies, resolving discrepancies by using standard procedures or returning incomplete documents to the team leader and/or supervisor for resolution. Enters customer and account data by inputting alphabetic and numeric information on the keyboard according to screen format. Verifies entered customer and account data by reviewing, correcting, deleting, or reentering data; combining data from when account information is incomplete; purging files to eliminate duplication of data. Objective : To work for a company in a highly motivating and challenging environment that provides the best opportunities to grow and utilize my potential to the fullest to achieve the organization's goal while achieving my personal goals. Identified and resolved scanning problems under the wrong batch numbers and sent to be clarified by the client. Read source documents such as canceled checks, sales reports, or medical bills, and enter data in specific data fields. Eliminated illegible records by sending the records to be rescanned. Compare data with source documents or re-enter data in verification format to detect errors. Analyzing the data errors, reporting problems with the data, check source documents for accuracy and verifying when necessary and research further information for incomplete documents. Maintained filing systems, filed and retrieved documents, manuals, reports, and other materials. Performed data entry of material from source documents to a remote computer database. Summary : Energetic self-starter who is creative, can work independently or with a team. Enthusiastic when it comes to work and can maintain a positive attitude under changing work circumstances. Possesses good work ethics that make long-term relationships with customers. Input any missing data missing from prescriptions that were emailed, faxed, or mailed into caremark. Transmits claims on a daily basis and work all denied/rejected claims in order to meet filing deadlines. Constructed a training system for not only new employees but current employees, so that each member can become an expert. Review claims for duplicates, denials and referrals and ensures that claims information is matched to appropriate authorization. Transcribe phone messages and manage email communications for staff employee. Assist in processing of transportation department purchasing and payables. Performed all admissions for data entry including inputting physician's plan of care and other medical information as needed. 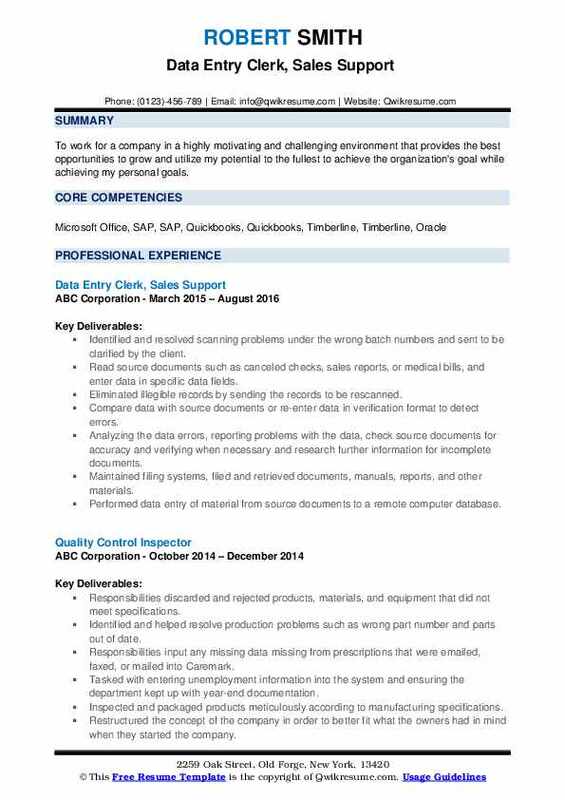 Objective : To secure a position with a well-established organization with a stable environment that will lead to a lasting relationship and career within the company. 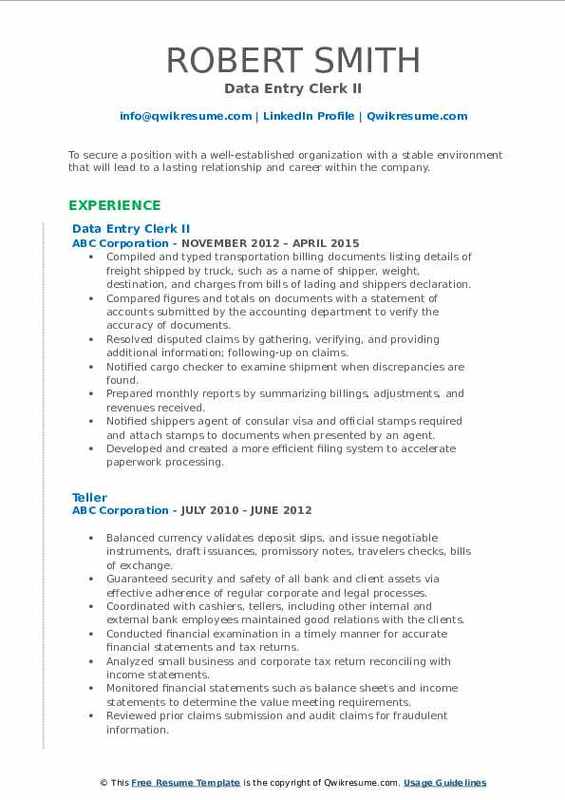 Compiled and typed transportation billing documents listing details of freight shipped by truck, such as a name of shipper, weight, destination, and charges from bills of lading and shipper's declaration. Compared figures and totals on documents with a statement of accounts submitted by the accounting department to verify the accuracy of documents. Resolved disputed claims by gathering, verifying, and providing additional information; following-up on claims. Notified cargo checker to examine shipment when discrepancies are found. Prepared monthly reports by summarizing billings, adjustments, and revenues received. Notified shipper's agent of consular visa and official stamps required and attach stamps to documents when presented by an agent. Developed and created a more efficient filing system to accelerate paperwork processing. 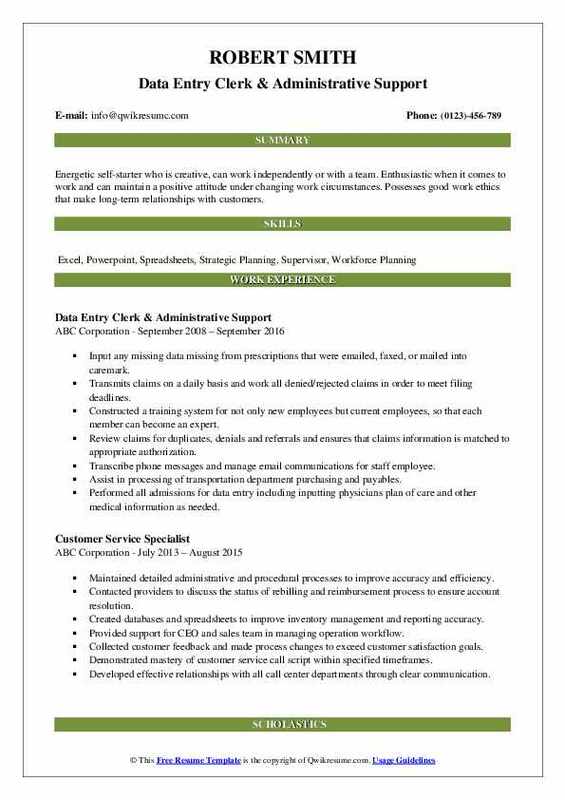 Objective : Over 3 years of experience performing various data entry and back office clerical tasks. A proven track record of efficiency and accuracy in analyzing data for errors and entering data using multiple computer programs. 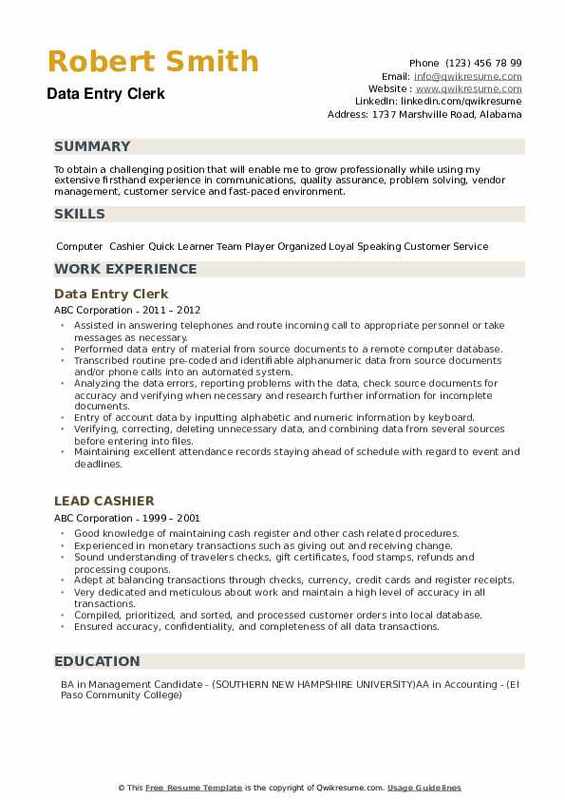 Known for being a fast learner, well organized, having excellent communication, and time management skills. Enter the patient's information into nextgen healthcare, an electronic healthcare record management system. Identify, research, resolve issues, errors, and missing data by reviewing, correcting, deleting, re-entering, and eliminating duplicate data. Prepare medical records for data entry by compiling and sorting medical records. Resolve deficiencies by returning incomplete medical records to quality assurance coordinator for resolution. Maintain patient's confidentiality by protecting medical record information. Contribute to the team's effort by relating new ideas for continuous improvement. Generated data information reports to appropriate personnel, as requested. Objective : Friendly and enthusiastic Administrative Assistant with four years of specialization in Client Based Organizations. Able to learn new tasks quickly and proficient in growing key client relationships. Represents establishment with friendly, professional demeanor at all times. Performed other clerical duties such as answering a telephone, sorting and distributing mail, running errands or sending faxes. Answer phone takes messages and assists in positive communication with all other district personnel. Handle complaints and refunds appropriately and courteously according to policy - perform light paperwork duties to include bank deposits and shift schedules. Understand and articulate policies regarding booking fees for patron events. Provide administrative support to include typing/word processing, mail preparation, copying, distribution, telephone calls, and booking coordination for conference rooms and base hotels - prepare a variety of correspondence and memorandums for all civilian and military personnel using community center conference rooms for training and events. Assisted center personnel in all areas of clerical support as necessary. 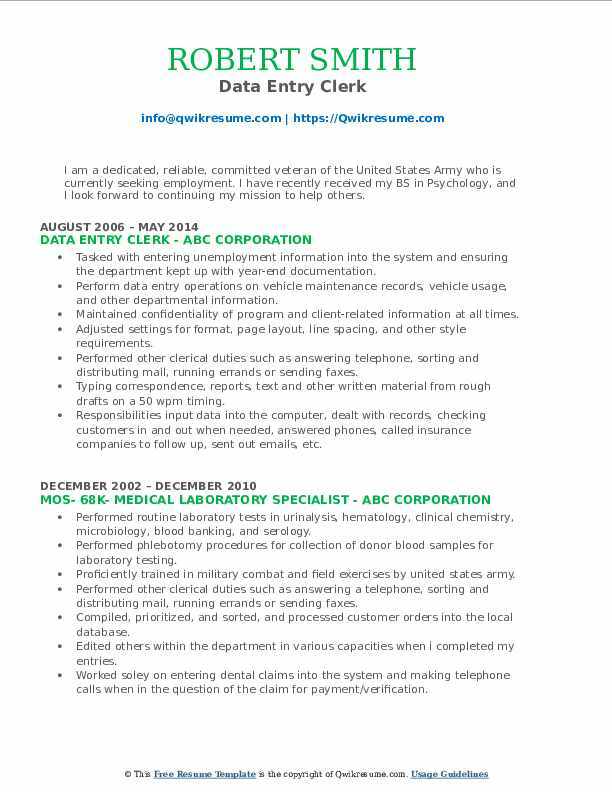 Summary : I am a dedicated, reliable, committed veteran of the United States Army who is currently seeking employment. I have recently received my BS in Psychology, and I look forward to continuing my mission to help others. Tasked with entering unemployment information into the system and ensuring the department kept up with year-end documentation. Perform data entry operations on vehicle maintenance records, vehicle usage, and other departmental information. Maintained confidentiality of program and client-related information at all times. Typing correspondence, reports, text and other written material from rough drafts on a 50 wpm timing. Responsibilities input data into the computer, dealt with records, checking customers in and out when needed, answered phones, called insurance companies to follow up, sent out emails, etc. Objective : Demonstrate, support and coordinate with management personnel regarding the identification of problems, data management, and provide problem-solving, also giving my recommendations to drive your company to be number one but by doing that following goals and standards. 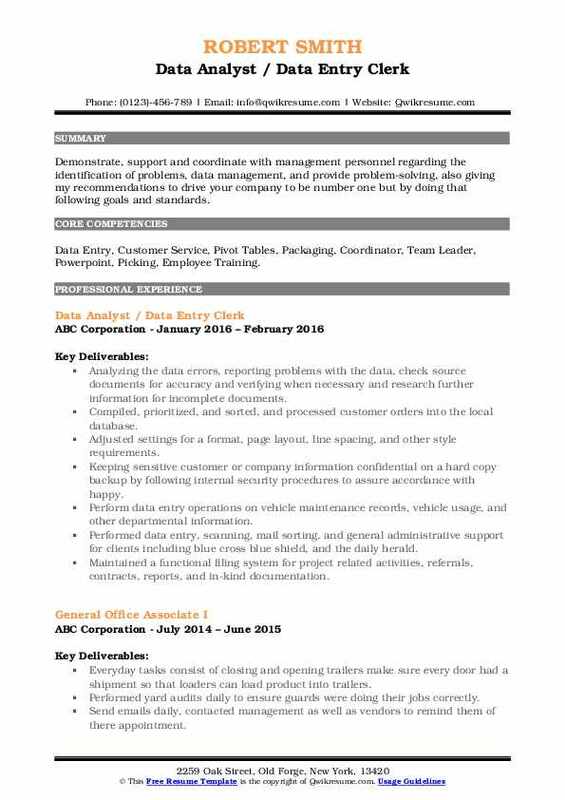 Skills : Data Entry, Customer Service, Pivot Tables, Packaging, Coordinator, Team Leader, Powerpoint, Picking, Employee Training. Compiled, prioritized, and sorted, and processed customer orders into the local database. Adjusted settings for a format, page layout, line spacing, and other style requirements. Keeping sensitive customer or company information confidential on a hard copy backup by following internal security procedures to assure accordance with happy. Performed data entry, scanning, mail sorting, and general administrative support for clients including blue cross blue shield, and the daily herald. Maintained a functional filing system for project related activities, referrals, contracts, reports, and in-kind documentation. Summary : To obtain a challenging position that will enable me to grow professionally while using my extensive firsthand experience in communications, quality assurance, problem solving, vendor management, customer service and fast-paced environment. Assisted in answering telephones and route incoming call to appropriate personnel or take messages as necessary. Transcribed routine pre-coded and identifiable alphanumeric data from source documents and/or phone calls into an automated system. Entry of account data by inputting alphabetic and numeric information by keyboard. Verifying, correcting, deleting unnecessary data, and combining data from several sources before entering into files. Maintaining excellent attendance records staying ahead of schedule with regard to event and deadlines.